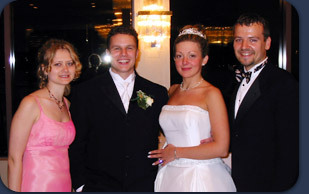 We will coordinate all of your reception events with you and your Maitre D' - no need to worry! You will customize your reception. We'll work with each wedding party on a detailed song list which lets us know exactly the types of music you want during entrance, first dance song, father/ daughter & mother/son dance, dinner, etc. For dinner music you may be looking for a truly elegant reception. You may choose Classical Baroque, or a mix of contemporary and traditional jazz, light rock, R&B and oldies. While every Bride and Groom are different, so is every reception, that's why we pride ourselves in finding out what YOU want for your special day. Our music selection is huge! We bring our entire collection with us to each event so we are always ready for last minute changes and special requests. We make every reception fun and memorable for everyone and can include fun songs like the Y.M.C.A, the Electric slide, and the Dancing Queen to get the party going. We add new music to our collection monthly and are always ready with the latest dance hits, while at the same time having that special song for an older relative's special requests. Our selections range from the Big Band era all the way to today's top 40. We would love to provide our services for your wedding reception, but be sure and book early - three months in advance is not too soon and Saturday evenings book especially fast. We are not a DJ booking agency therefore our availability is limited. Running out of time and still looking for that perfect photographer or florist? We can help. We know people. Check out our list of friends and vendors, or contact us for referral.